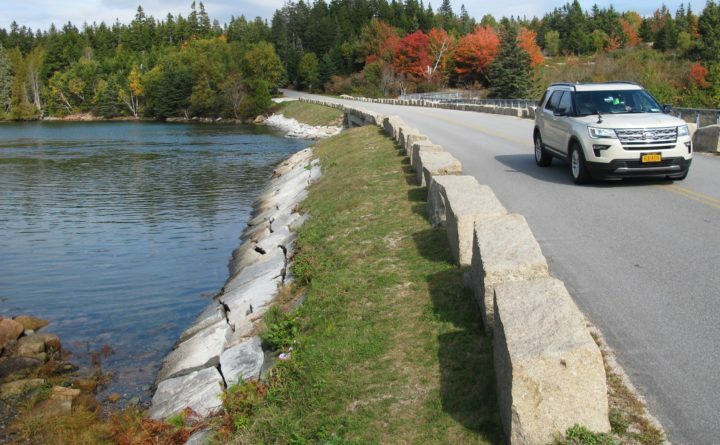 A car travels across a causeway on the Schoodic Loop Road in Acadia, Oct. 10, 2018. National park officials say hazardous trees will be cut down at Acadia National Park over the next three months. The National Park Service says many of the trees slated to be removed are dead red pines that succumbed to red pine scale, an invasive insect that harms the trees. The service says cutting of trees will occur from the middle of this month until May 15. The service says the key area of the work is a 1.2-mile section of Sargeant Drive, where trees will be removed because they are a risk to people and property. The work will necessitate reducing traffic to one lane when it’s necessary. The service says the cutting strategy does not increase fire hazard in the area.